Constantly waking up in middle of the night to adjust a duvet or turn over to the ‘cooler’ side of the pillow is frustrating. And after just a few nights of tossing turning in bed we begin to suffer the effects of sleep deprivation. We often don’t notice the impact on our mental abilities and ultimately put our health at risk. Poor sleep is also linked to weight gain and weakened immune systems. If you don’t snooze, you lose. It is also important that you factor in the quality of your air conditioning. Your aircon must be properly maintained and operate with clean filters to ensure a healthy sleeping environment. Another factor is the consistency of the airflow. An aircon that constantly blasts cool air at you can have negative consequences. 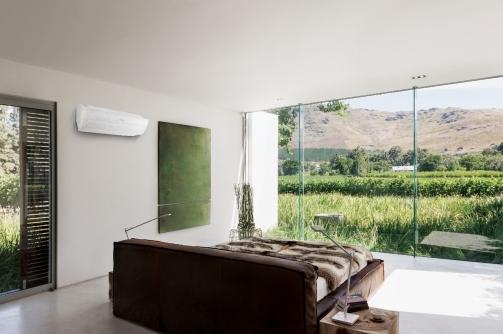 Samsung’s Wind-Free™ technology is an example of good airflow control. After you’ve selected the desired temperature with Fast Cooling mode, it maintains the ideal temperature without any direct wind by gently dispersing cool and still air through micro air holes for a natural cooling effect. This also negates the stuffiness people feel in artificially regulated temperatures.